In order to install InstantForum on your own servers you'll need to ensure you have the components listed below. Windows Server 2016, 2012, 2012 R2, 2008. Azure Web Apps are also supported. SQL Azure is also supported. 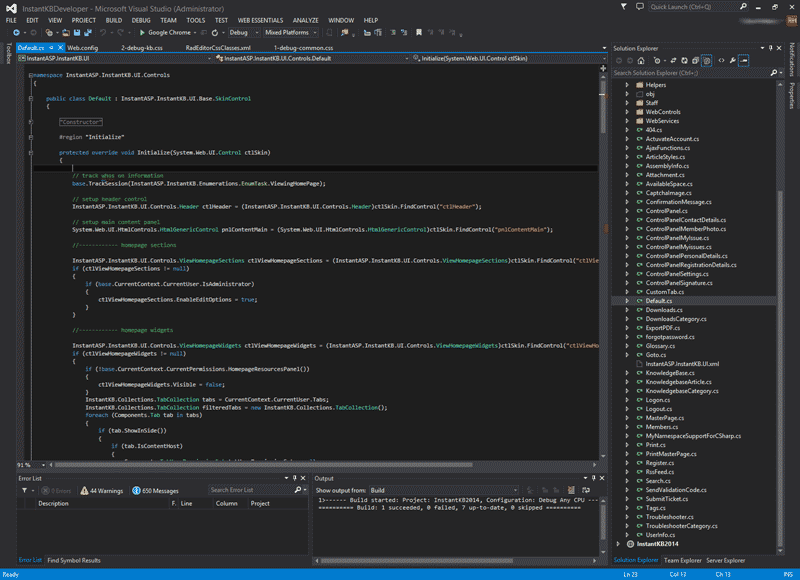 Visual Studio 2013 or above (C# source code). Visual Studio Code edition is also supported. All modern versions of Chrome, FireFox, Safari & Opera. All modern versions of Chrome, FireFox, Safari, Opera & Android Browser. In order to modify source code within our products we would recommend Visual Studio. Both Microsoft® Visual Studio 2013 and 2015 are supported. Visual Studio is not required to customize the look & feel, create new skins or modify the HTML contained within the template files. Visual Studio is only required if you intend to modify the product source code. The various InstantForum web application files (excluding source code files) will require at least 150mb of disk space on your web server. Please bear in mind this size will grow as users upload profile photos or embed images within posts. The fresh InstantForum database with no data will be around 10mb. A fresh database with only the single default administrator account and welcome post is very small. the size of the database will grow as real data is added to your tables.